Service Untitled» Blog Archive » Make positive feedback easy. A reader recently wrote in and told me about how she struggled to give positive feedback to Alaska Airlines. She had a positive experience with the airline and wanted to write them a simple note thanking them and showing how satisfied she was with the customer service experience. When you manage to the find the page (which you can jump to by clicking here), you are presented with a rather lengthy form that asks for a whole bunch of personal and flight information. 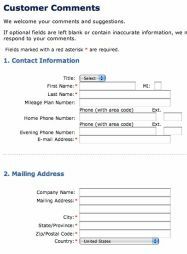 The form doesn’t make it easy to just whisk off a quick comment (good or bad) and it makes the act of giving positive feedback quite a tedious process. While it makes sense for Alaska Air’s form to be thorough, it would make more sense to have a way to expand the form if the customer wants to provide more information. For positive comments, a name and email address would be plenty. For negative comments, hopefully the company has a way to search for reservations using basic information (such as a name and flight number) and doesn’t need to ask for a whole bunch of information. The page could ask “Is this a positive or negative comment?” If the customer chose positive, it could present them with a simple form. And if the customer chose negative, then the form could expand. It’s a simple thing to do, but it can make a big difference. Companies should never make it difficult to submit feedback – good, bad, or neutral. This is a great example of how the use of “skip logic” in your satsifaction survey can be used. Make is short and sweet for someone to provide positive feedback, but ask a few more clarifying questions when the feedback is more critical in nature. « A quick “good job” to an employee.